The Opel Grandland X's skid plate at the front gives the model an SUV look. The hood features the signature Opel crease. 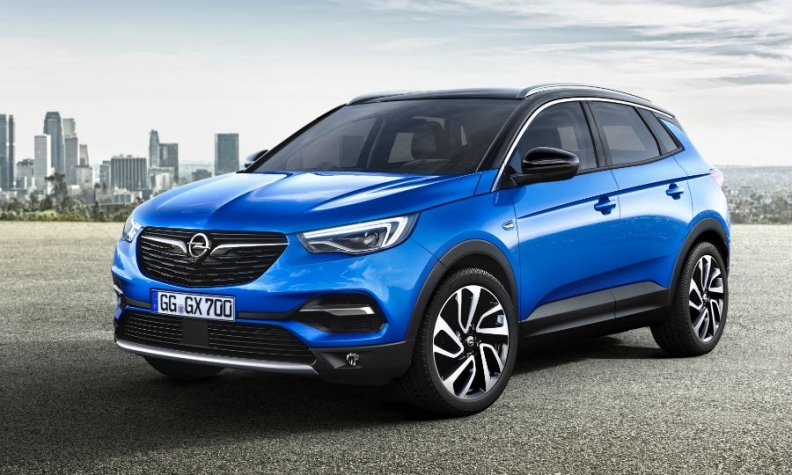 FRANKFURT -- Opel/Vauxhall has unveiled the Grandland X, the automaker's latest model underpinned by a platform from its new parent, PSA Group. 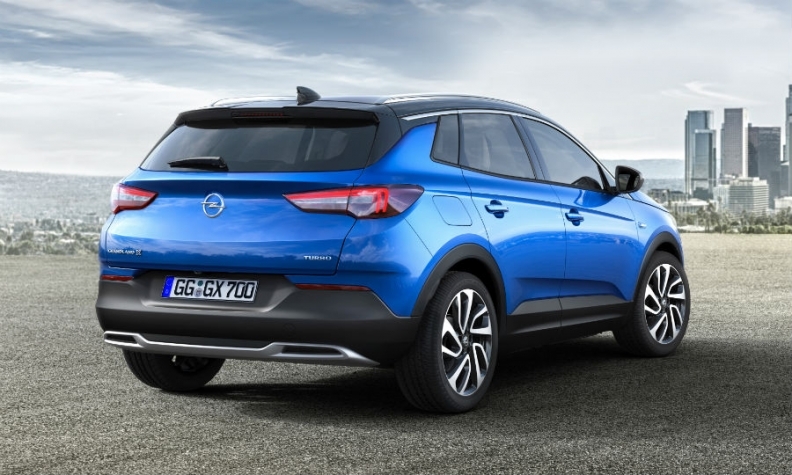 The Grandland X will be a stylish newcomer that is "ready to attack" in the booming compact SUV/crossover segment, Opel CEO Karl-Thomas Neumann said in a statement on Wednesday. The crossover will go on sale soon after its public debut at the Frankfurt auto show in September. It will compete in a segment dominated by the Nissan Qashqai and Volkswagen Tiguan. At 4477mm long, 1844mm wide and 1636mm tall, the Grandland X's dimensions put it in direct competition with the Tiguan, rather than the slightly smaller Qashqai. The Grandland X has a sporty, off-road look and a heightened seating position typical of an SUV, but the model will not offer all-wheel drive. Its smaller sibling, the Crossland X subcompact crossover, also does not have awd. Opel said the Grandland X will offer a feature it calls Grip Control that improves traction in diverse driving situations such as snow and ice or sand and gravel. The Grandland X will have many of the safety features found in the Opel/Vauxhall Insignia Grand Sport midsize sedan that launches in June, including automatic braking in an emergency, such as when the vehicle identifies a pedestrian on the road. The new crossover also offers a parking assistant as well as a 360-degree camera function for maneuvering into small spaces. The Grandland X has muscular, sculpted wheel arches and protective cladding on the lower body. Additional comfort features include ergonomic seats and the ability to open the crossover’s trunk with a movement of the foot, which Opel currently offers only in the Astra station wagon and Insignia. Opel has suffered from its lack of SUVs, especially in Europe's compact SUV/crossover segment, which grew by 21 percent to 1.44 million units last year, according to data from market researcher JATO Dynamics. Competition is fierce with six different nameplates registering volumes of more than 100,000 sales last year, led by the Qashqai with the Tiguan at No. 2. Opel's highest ranking model in the segment last year was the Antara at No. 22 with just 2,050 sales. Opel is ending Antara sales. The Grandland X shares its EMP2 architecture with the new Peugeot 3008 and upcoming Citroen C5 Aircross and DS 7 Crossback models. The Opel model will be built in PSA’s plant in Sochaux, France. The smaller Crossland X, which will go on sale in the summer, shares its platform with the next Peugeot 2008 and the upcoming Citroen C3 Aircross. Opel will build the Crossland X and PSA's versions in Zaragoza, Spain. PSA and Opel began to jointly develop new models, including the Grandland X and Crossland X, after PSA and Opel parent General Motors signed an industrial partnership in 2012. In March, PSA agreed to buy Opel and its UK sister brand, Vauxhall from GM.